Have you ever experienced a sudden uncomfortable tingling sensation in your teeth when you're drinking ice-cold water or eating something sour? Ooouucchh.. What happened? (a) Enamel. It's the outer hard layer and doesn't have nerves. It cannot repair or heal itself. (b) Dentine. It is covered by the enamel on the crown, and protected by the cementum in the root. It can register pain and can repair itself. (c) Pulp. It contains the nerves and blood vessels. If in any way it is exposed to decay or injury, it will die and cause severe pain. Our teeth can become sensitive in the dentine and pulp area. It is triggered by heat, cold, sweetness or sourness. It may be from food, drinks or even breathing in cold air. The pain can be sharp or a dull ache, it can be sudden or come on gradually. It can last for a little while or a long time. Sensitive teeth occurs when our dentine is exposed. It's not a tooth cavity. It happens because of receding gum tissue. 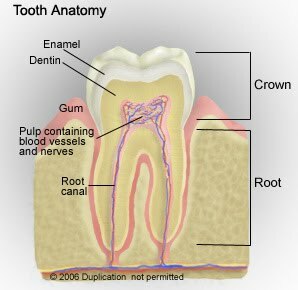 The root which are not covered by the enamel are exposed, resulting in the sensation reaching our teeth's nerves. Brushing your teeth too hard and using a hard-bristled toothbrush, which wear down your enamel and recede your gums. If your tooth decays near the gum line, it exposes your dentine. If your gum moves away from your tooth as a result of disease such as gingivitis (inflammation of your gums). There may be loss of supporting ligaments of the gum, resulting in the root of your tooth being exposed. 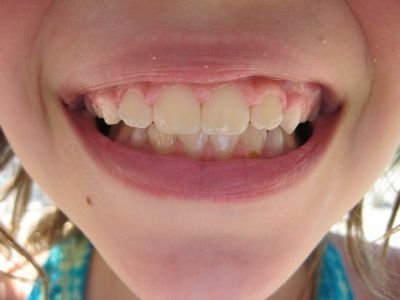 If you have cracked, broken or chipped teeth which may be filled with plaque. The bacteria will enter the pulp to cause inflammation. If you grind your teeth or clench your jaw very often, it can wear down the enamel. It you use too many tooth-whitening products or mouthwash that contains acids. If you like eating a lot of acid-containing foods like oranges, lemons, tomatoes and pickles. If you like to drink a lot of tea. If you recently had a dental procedure. But sensitivity caused by this usually disappears within 6 weeks. Brush your teeth with a soft bristled toothbrush. Don't eat acidic foods or drink ice water. Don't grind your teeth. Use a mouth guard at night if you do it during your sleep. I highly recommend Greenzhi Toothgel, which I have been using the last few years. It's not harsh, it doesn't leave a strong after taste and it's very gentle on my mouth and tongue. Click on this link to read what my dentist says.